One of the great mysteries of genetics is where exactly on the Y chromosome does the unfettered enjoyment of all things explosive reside. That said, watching imploding buildings and exploding ships on YouTube would seem to be to males what videos of kittens and cute toddlers are to many women. Don’t tell me there isn’t a McArthur Fellowship waiting for the individual who can determine where on the human genome the difference resides. The above implosion took place Wednesday at Sparrows Point Terminal in Baltimore. The former Bethlehem Steel L-furnace, which stood 32 stories tall, weighed more than 11 million pounds and was the largest furnace in the western hemisphere, was brought down to make way for new businesses and Port of Baltimore-related development. The demolition was handled by Baltimore-based Controlled Demolition Inc. The edifice actually consisted of two structures: the 320-foot-tall blast furnace and the free-standing exoskeleton around it that provided various levels of access. Controlled Demolition used 94 explosive charges at 12 separate points, according to WBAL-TV. The Controlled Demolition’s video shows the implosion from no fewer than six different angles, including a spectacular slow-motion view that begins at the 1:37 mark. For a society that prides itself on technological savvy, a segment of the Western world seems utterly unable to comprehend one of the simplest concepts concerning Internet security. SplashData, a California-based provider of password management applications, reports that the most common Internet password held by users in North America and Western Europe in 2014 – once again – was “123456”. Next up was the even less imaginative “password”. Since SplashData started its study in 2011, “123456” and “password” have been the top two passwords each and every year. This, despite the fact that millions of accounts are hacked annually, technology employed by hackers is constantly improving and countless warnings not to use insipid passwords are issued regularly. At this point, anyone who goes with “123456” or “password” is all but asking for their information to be stolen. Especially if one goes with “password”. Talk about the height of laziness. You might as well just give your boss your resignation slip, put on a pair of old sweats and call it a career because you aren’t even trying anymore. Other common passwords included “12345” – for those unable to type in a full six digits – and the ever-so slightly longer “1234567”, “12345678” and “1234567890”. Given that hackers employ computer programs that can run through common passwords in a matter of seconds, using sequential numbers such as the above is barely a step above packaging up your data and mailing it to the bad guys. Other number-based passwords include “111111” (no need to even move your finger while you type! ), “123123”, “696969” and the crafty “abc123” (unimaginative and lazy). For the technologically indolent who are number-adverse there’s “qwerty”, “letmein” and “access”. Yes, nothing screams “computer whiz” like the password “letmein”. I believe both Bill Gates and Steve Jobs used that for years, although Jobs preferred “letmein1”. Finally, a couple of other notably bad passwords: “superman” and “batman”. The above passwords might be understandable if they were taken from a group of 5th graders, but SplashData based its list on more than 3.3 million passwords that were leaked last year. That means a significant number of adults actually thought the “batman” and “abc123” were credible passwords. No one deserves to be hacked, but some folks sure seem determined to extend an attractive invitation. While it shares the exotic-sounding names of counterparts Europa and Ganymede, Jupiter’s second-largest moon Callisto is decidedly less glamorous. For one thing, it has the notoriety of being the most heavily cratered object in the solar system. Callisto is also unusual in that it orbits at a distance of nearly 550,000 miles from Jupiter, much farther than the planet’s other large moons. Ganymede, by comparison, orbits nearly 500,000 miles closer to the red planet. “This isolation means that Callisto does not experience any significant tidal forces from Jupiter that would tear at its structure,” according to RedOrbit. “It also does not show any signs of geological processes such as volcanism or plate tectonics, which we clearly see on moons that are involved in violent cosmic tugs-of-war with Jupiter, such as Io (Jupiter’s other large moon), Europa and Ganymede. “Callisto remains relatively intact and is a witness of the early Solar System: its surface is the oldest terrain, at a truly ancient four billion years,” the publication added. 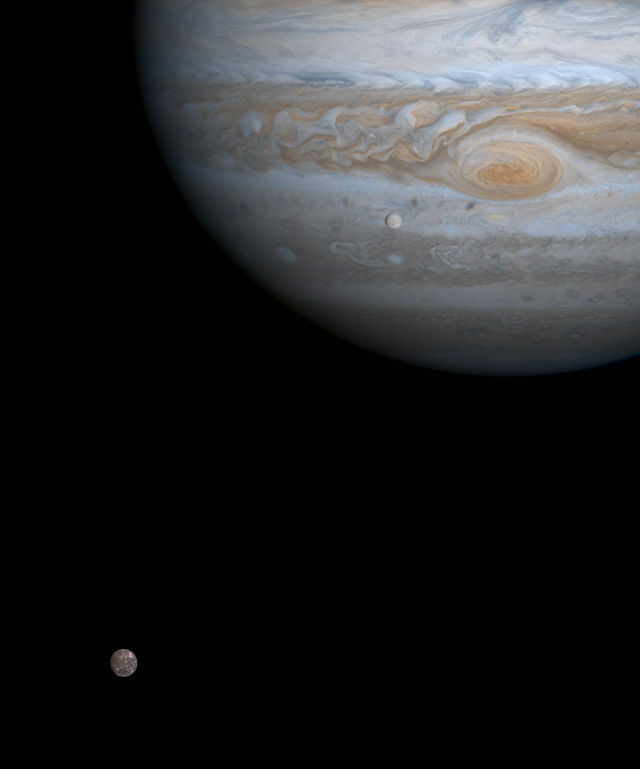 Callisto, shown in lower left, orbiting Jupiter, as viewed by Cassini. Discovered by Galileo Galilei in 1610, Callisto is the third-largest moon in the Solar System. The above image was taken in May 2001 by NASA’s Galileo spacecraft, which studied Jupiter and its moons from 1995 until 2003. 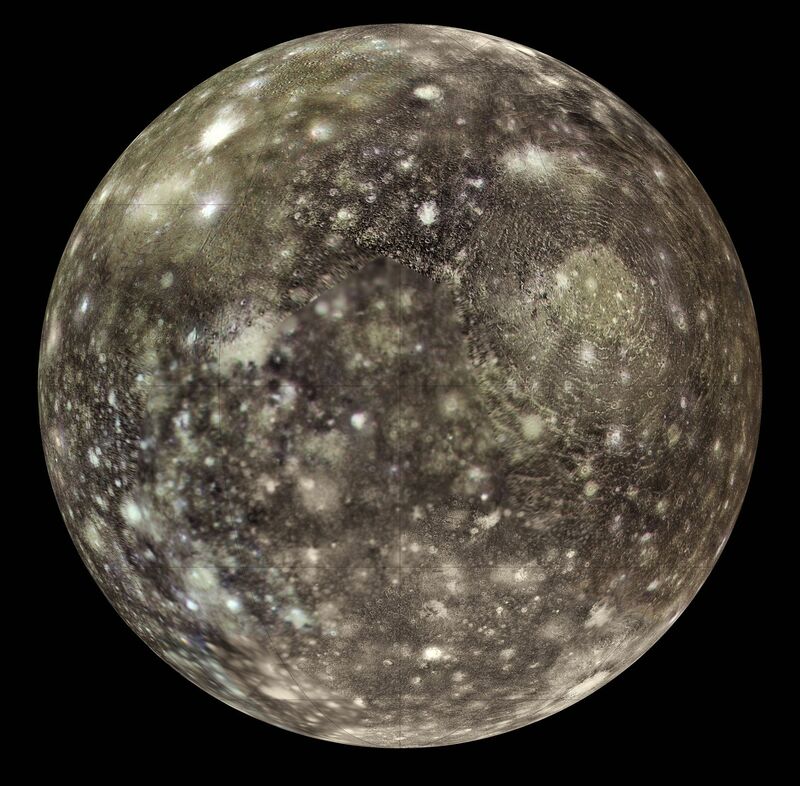 The image suggests that the brighter parts of Callisto’s surface are mainly water ice, while the darker patches are regions of highly eroded rocky material. We’ll get another chance to learn more about this lonely satellite before too long. Next year NASA’s Juno spacecraft will arrive at Jupiter and begin beaming back images of the planet’s poles. In 2022, the European Space Agency will launch Juice, short for Jupiter Icy moons Explorer, which will tour the area with the goal of expanding knowledge of the red planet and its environs, especially moons Ganymede, Europa and Callisto. Some of my best childhood memories center on a couple of years I spent fishing along the banks of the Colorado River. To this day, there is something about spending time along – and in – rivers that brings me great contentment. When the weather is warm, which is often in South Carolina, I make a point to take my kids to rivers and streams across our state where we can swim, fish and explore, enjoying adventures that, unfortunately, too few American children seem to experience any more. If I’m traveling across the state for work I’ll sometimes bring a fishing rod. On more than one occasion I’ve taken off my shirt and tie, rolled up my pants legs and waded into shallow rivers to try my luck. More often than not I don’t catch anything in the 10 or 15 minutes I spend throwing a lure into distant pockets of water, but I always feel better afterward. I was reminded of the serene beauty of gently flowing water when I recently happened across Albert Fitch Bellows’ painting The River Bank (above), at the Columbia Museum of Art. 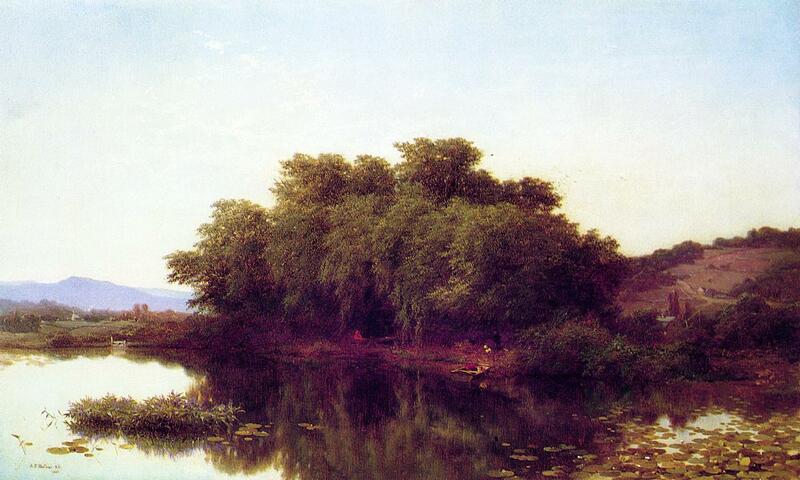 According to the museum, it’s unclear whether Fitch’s 1861 work actually depicts a river or, more likely, a mill pond. But the beauty and serenity of the scene is inescapable. Viewing the painting took me back immediately to my time on the Colorado River, when my friends and I would fish, swim and hunt to our heart’s content, with the only evidence of human existence being the occasional distant rumble of a Denver and Rio Grande Western freight train and the steam whistle signaling shift changes at a local plant. One of the blessing of my life is that I’m able to live in an area where I can recapture at least a little nostalgia of my youth, and also pass it on to my children. More than 40 years after noted poet, diplomat and politician Pablo Neruda died, Chilean officials say they will begin a fresh inquiry into his death. Neruda, a Nobel Prize winner considered one of the greatest poets of the 20th century, died on Sept. 23, 1973, less than two weeks after the military coup that ushered Gen. Augusto Pinochet into power. Government spokesman Francisco Ugas said there are indications that Neruda could have been poisoned. Neruda’s body was exhumed in April 2013 and tests conducted on his remains, but no indication of poison was found at that time. However, more tests are planned with scientists looking for traces of inorganic or heavy metals, according to the BBC. The upcoming investigation will seek to detect cellular or protein damage caused by chemical agents. Previous tests focused specifically on the discovery of toxins, according to the BBC. “There is initial evidence that he was poisoned and in that sense the signs point to the intervention of specific agents,” said Ugas, who is head of the government’s human rights department. Neruda’s death certificate says he died of prostate cancer. 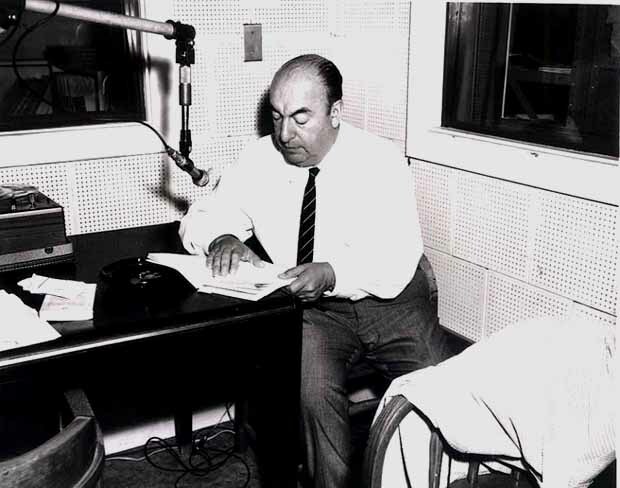 Neruda was a member of Chile’s Communist Party and lawmaker who held diplomatic posts in France, Spain and Mexico. He was a staunch supporter of deposed President Salvador Allende and it was believed he would become a thorn in the side of Pinochet’s regime. Neruda was hospitalized with cancer at the time of Pinochet’s coup. Pinochet denied permission for Neruda’s funeral to be made a public event. However, thousands of grieving Chileans disobeyed the curfew and crowded the streets. One thing that has largely escaped my understanding is crying over the outcome of a sporting event. I’ve been upset at the result of many a game – to this day I snap off the television whenever Kirk Gibson’s game-winning home run in Game 1 of the 1988 World Series is shown, to the point where I still have never seen it in its dastardly entirety – but I have never been moved to tears. When it comes to fans, however, unless the individual shedding tears is a parent, spouse or possesses some very close bond to an athlete playing, crying because your team loses is ridiculous. Crying when you’re team loses a regular season game is flat-out absurd. Thus, we have the above unnamed individual, who, as we can see, took Duke University’s 90-74 loss to the University of Miami last week rather hard. But, as though bursting into tears wasn’t bad enough, she took it a step further. 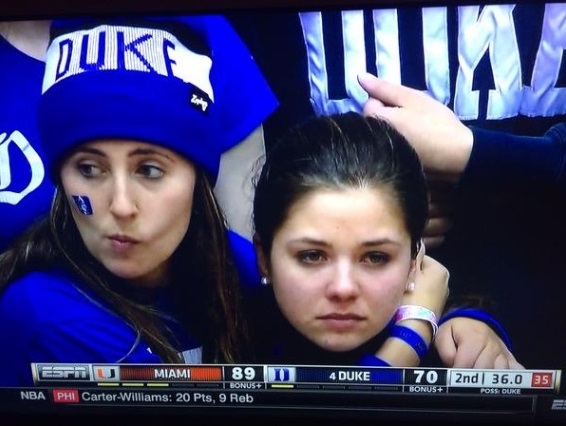 After the histrionics were shown on television, the sports journalism site The Cauldron captured a screen grab of the weepy Duke follower and posted it on its Twitter site. Not surprisingly, the image was retweeted numerous times. A couple of points: Beyond the sense of entitlement that the student exudes, one can’t help but be stunned that someone of college age would believe that asking a website to remove an image would actually eliminate said image from the Internet. If you don’t want a photo of yourself bawling like a 7-year old who just witnessed her beloved pet being flattened by a semi floating around the ether for all eternity, then don’t burst into tears when a group of scholarship athletes lose a basketball game. And for goodness sakes, don’t do so when your team loses a regular season basketball game. Just how sheltered has your life been when this is what causes you to go into meltdown mode, anyway? More than a million Irish died as a result of the Great Famine that struck the island in the 1840s. Another 2 million emigrated in a desperate bid for a better life, with many setting sail for North America. What’s less well known is that among those who departed amid the tragedy of the Great Hunger, an estimated 100,000 died in transit. Bones discovered on Quebec’s Gaspé Peninsula in 2011 have recently been identified as those of children, aged seven to 12, believed to have been Irish who died fleeing the famine. Vertebra and jaw bones are among remains confirmed by Parks Canada following three years of research to be those of malnourished children. It seems likely they died while fleeing the Great Hunger almost 170 years ago, according to IrishCentral. 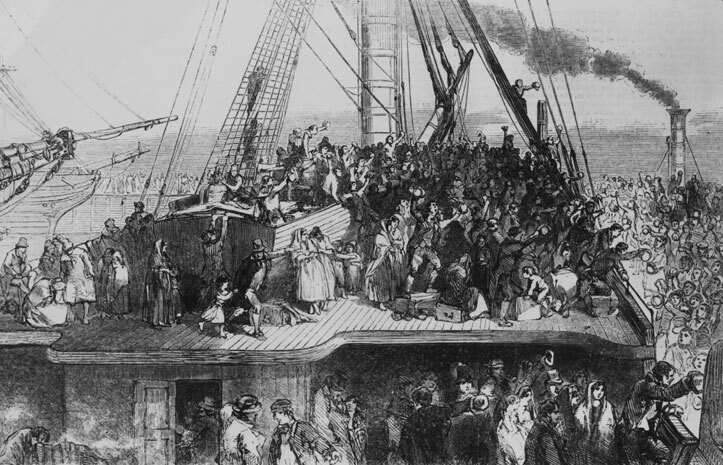 Many of those two million who left Ireland traveled to America on ‘coffin ships,’ which were themselves deadly. Coffin ships were crowded and disease-ridden, with poor access to food and water. They usually transported the poorest of the poor, and suffered mortality rates as great as 30 percent. One of these ships, the Carricks, set sail from Ireland to Quebec City in 1847. It sank off Cap-des-Rosiers, about 500 miles northeast of its goal, and 87 people died. The 100 survivors were taken in by families in the village. A monument was erected in 1900 to remember the victims. In 2011, skeletal remains were discovered 40 yards away from the marker. Without DNA evidence and carbon dating it’s uncertain whether the children traveled aboard the Carricks. Researchers were able to determine that children – two of them between seven and nine years old and another as old as 12 – showed evidence of rickets, a vitamin D deficiency, and malnourished, according to the publication. Georges Kavanagh, a resident of Gaspé, can trace his ancestors back to the victims and survivors of the shipwreck. He told the Washington Post that he plans to ensure they get a proper reburial. The Irish famine is commonly attributed to widespread potato blight that led to devastation of the staple crop of millions of Irish, resulting in starvation. This despite the fact that Ireland was still producing and exporting butter, peas, salmon, rabbit, lard, herring, honey, tongues, onions, seed and more. These commodities were shipped out of Ireland to Britain, demonstrating what could be at best be termed a misguided policy on the part of the United Kingdom, policy that was instrumental in the disaster. Between death and emigration, Ireland’s population fell by an estimated 20 to 25 percent, and even today is still below pre-Famine levels.